The ultimate worship album has arrived! Tis So Sweet To Trust In Jesus – The reassurance of trusting in Jesus Christ for everything is so simple. Grace compels you trust in Him all the more. Steven states how sweet it is to trust in Christ. The up-beat folk tune with a live band sounds like a song you would expect to greet you in the South. How Great Thou Art featuring Jillian Edwards Chapman – Have you ever been utterly amazed? Steven and Jillian put a modern twist on classic hymn. This song describes how pleased and overwhelmed they are by everything God has created and all he does for Christians. This medium tempo country ballad will have you in awe. What A Friend You Have In Jesus featuring Ricky Skaggs – You can take everything to Jesus Christ in prayer! This single is another hymn that explains how Christians can share all of their news (the good, bad and numerous burdens) with Jesus Christ. He listens and can bear your worries for you. The guitar accompaniment makes the song feel like apart of a worship service. Blessed Assurance – This is a true song of praise and worship. Steven sings about the assurance of God’s mercy and love for him. He is grateful for the promise of Heaven at the end of his earthly life. Steven is elated that he is “praising my Savior all the day long”. This bluegrass tune makes you feel right at home wherever you live. Life Is Like A Mountain Railay [Railway] featuring Herb Chapman Sr. and Herb Chapman Jr. – Keep your eyes on God no matter what and you will go to Heaven. Steven, his dad and his brother compare life to a train ride. If Christians never lose their faith in God through their journey in life they will enjoy eternal life. You can gather round your loved ones and dance to this perfect square dance number. He Touched Me featuring Herb Chapman Sr. and Herb Chapman Jr – God makes you whole. After becoming a Christian, you feel complete. Their sins are washed away by the blood of Jesus Christ and you receive joy from on high. The three family members sing the entire song together and the track sounds like a choir or male trio is performing rather than a solo artist. Hiding Place – God will protect you no matter what. You can hide from all the trials and difficulties in life in God. Steven brings back the 1987 tune and helps listeners rediscover God’s grace and mercy. The slow ballad almost sounds like an acapella song. Rock Of Ages – Christian’s sins are hidden in Christ. Once you give your life over to God, your sins are washed away by His blood. Christians can rest in knowing Heaven is your reward after your time on earth is over. This resembles “Hiding Place” with the minimal music accompaniment. A violin or a member of the strings family stands out in this track. Be Still and And Know featuring Caleb Chapman – God controls everything. Be anxious for nothing and know God is taking care of anything and everything that happens in life. He is all powerful.“Be still and know He is Faithful,” Steven sings in the 1999 song. The music sounds like a peaceful body of water moving on a calm Spring/Summer day. His Eyes – You can never escape from God’s view. He sees you wherever you are. You are never alone and always under His watchful care. The mid-tempo live band music makes the whole song sound so inviting. My Redeemer Is Faithful and True – The title explains it all! Steven has trusted God throughout his life and He has always been there for him. God remains faithful and true. This song has the perfect country melody for an inspiration music video. Cinderella – This is a personal song about spending quality time with his daughters while they were still young. The 2007 single was inspired by his daughter Emily Chapman. 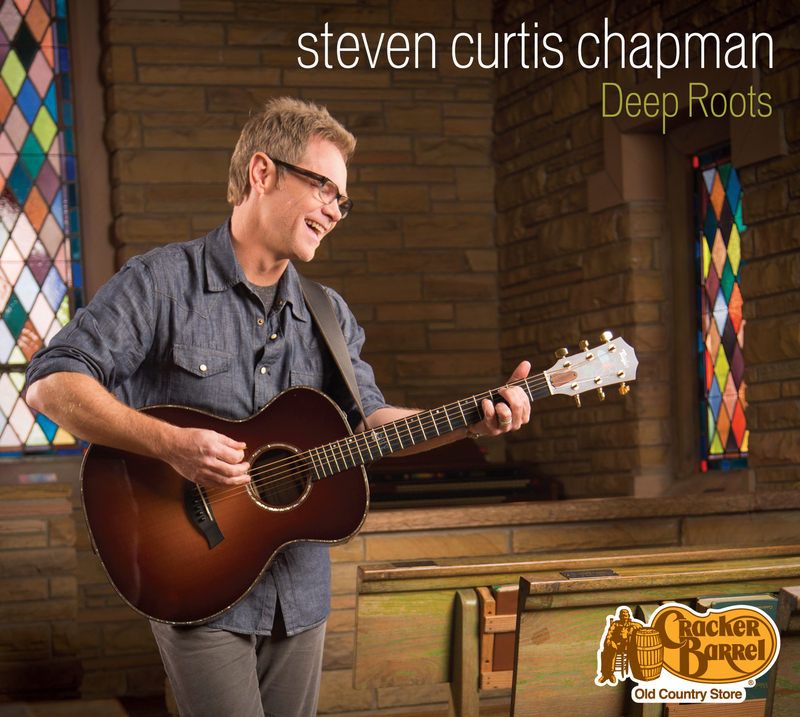 This entry was posted in Music, Reviews and tagged Deep Roots, Steven Curtis Chapman. Bookmark the permalink.